1080 Pressure Washing provides pressure washing and roof cleaning services for residential & commercial clients in Acworth, Alpharetta, Atlanta, Austell, Buckhead, Cobb County, Conyers, Dallas, Decatur, Doraville, Douglas, Douglasville, Duluth, Dunwoody, East Point, Fayette County, Fayetteville, Forest Park, Forsyth, Fulton County, Griffin, Henry County, Hiram, Jonesboro, Johns Creek, Kennesaw, Lawrenceville, Lithonia, Marietta, McDonough, Midtown, Newnan, Norcross, Peachtree City, Powder Springs, Roswell, Sandy Springs, Senoia, Smyrna and more. There are so many things to think about when it comes to running a business. One of the things that gets overlooked the most until it is too late is the roofing system. 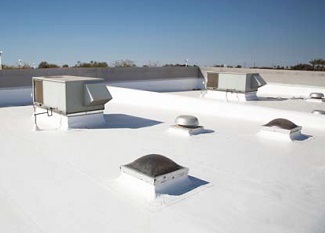 A clean roof that is free of mold, mildew and built up grime can not only improve the overall life of your Atlanta commercial roof, but at the same time it will allow the roof to do it's job reflecting the Atlanta sun and humidity that will cut down on your overall utility bills. Our team of Atlanta Commercial Roof Cleaners are experienced in the soft-wash roof cleaning process that will have your business looking clean and shiny in no time. Whether you add this service on to your commercial pressure washing project, or just select it as a stand alone service, you will find that the team at 1080 Pressure Washing can't be beat when it comes to effectively cleaning and washing your Atlanta commercial roof. This is typically a one day process and will not interrupt your day to day operations. In addition, the chemicals that we use to clean your roof are safe for any landscaping located below your roof. To learn more about our Commercial Roof Cleaning services offered in the Atlanta, GA area or to get your FREE Estimate on cleaning the roof of your business, give us a call at 678-849-1600 our friendly and knowledgeable team is standing by to answer any questions that you may have. 1080 Pressure Washing offers commercial roof cleaning services for all types of roof surfaces in the Atlanta, Ga and surrounding areas.